Five years before Alison Brie donned her spandex leotard for the Netflix hit wrestling series GLOW, Director Brett Whitcomb and Writer Bradford Thomason delved into the origins of this beloved band of colourful female wrestlers in feature doc GLOW: The Story of The Gorgeous Ladies of Wrestling. Below we revisit our original interview with Brett and Bradford and then catch up with the filmmaking duo to find out their thoughts on the critically lauded fictionalisation of the larger than life characters they rediscovered in their sophomore documentary. How did the two of you find your way to documentary? Brett Whitcomb: I’ve always been really into watching films since I was a kid, I was always obsessed with watching Kung Fu movies and stuff like that. It wasn’t until maybe 10/8 years ago that I started getting into directors like Bergman, Fellini, Kurosawa, Dreyer and Bresson. I got Netflix when it first came out and would get five DVDs at a time and study these directors. I would watch all their films and then rewatch them with the volume off so I could study their editing, lighting, pacing and storytelling. Brad and I were both DJs here in Houston, that’s how we met, and we were always tossing around an idea for a film. Homelessness is a huge problem here in Houston. When I would DJ at night in downtown Houston I would see like 50 homeless people on the way home, sleeping in nooks and crannies. Basically we just started taking the camera out, spending a lot of time on the streets talking to them doing interviews and trying not to be condescending about it. We never really did anything with that film but that was the beginnings of wanting to get into it. Documentaries were almost more out of necessity than they were, “Oh we want to be documentary filmmakers”. We just wanted to make film I guess. 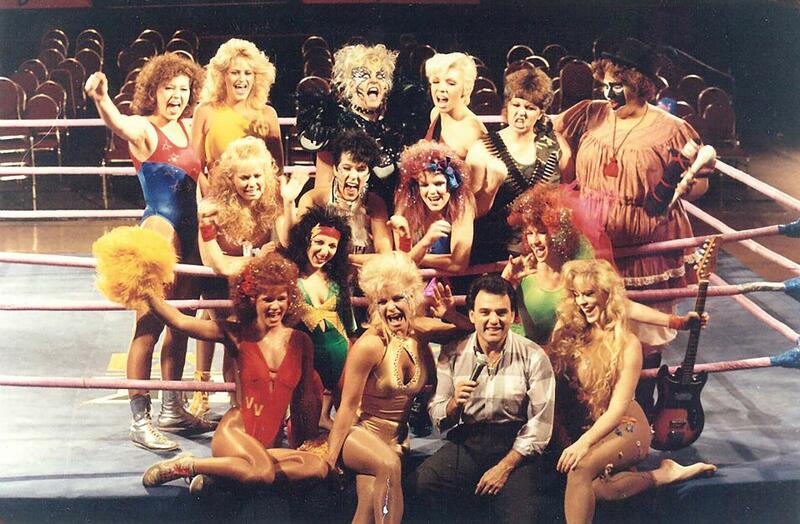 Bradford, you’re credited as the writer on GLOW: The Story of The Gorgeous Ladies of Wrestling and also on the first project that you guys did together The Rock-afire Explosion. How did you find yourself moving into that role, especially as a lot of people presume there isn’t a writer as such when it comes to documentary? Bradford Thomason: It’s like Brett said, we kind of fell into it out of necessity. We could make a short or we could make a documentary because both of those required smaller budgets. We wanted to make something full length so we decided to make a documentary. Going into it I had no idea what writing for a documentary meant. We did our best to outline what we thought the film would be but were so inexperienced that we didn’t even know how to do that. Once we’d got a lot of footage together it was a matter of actually learning how to write a film. You can’t just take a camera and point it at a situation for a year, cut it together linearly and expect to have a film. I think the misconceptions that there’s no writer with a documentary stems from the fact that on the surface most documentaries appear to just be portraits of reality playing out in front of the camera. If you really think about it that’s just not true. You can’t just take a camera and point it at a situation for a year, cut it together linearly and expect to have a film. You have to shape things that happen naturally and that’s where the writing really comes into play. Once we finished that first film I really got a handle on how writing and editing documentaries work together and then that really helped us with GLOW. In what ways do you feel diving in at the deep end on The Rock-afire Explosion prepared you for GLOW and how did you approach those two projects differently from a writing perspective? BT: With The Rock-afire Explosion we weren’t sure it was going to be a feature length documentary. We had one person we wanted to focus on and when we interviewed that person and spent some time with him he led us to several other people including the other primary subject in the film. Once we got connected to other people the whole scope of the project expanded immensely and I had to adjust as we went along with that. With GLOW I think we almost overcompensated because we knew that the story was going to present itself. We outlined the film based on the best case scenarios of what we thought was going to happen. We would storyboard it, not with drawings but with note cards, imagining what the film would look like from start to finish. And so we shot with that in mind, trying to cover everything that we possibly could, even more than we needed. While quite a lot of the women were really keen to talk to you, GLOW Creator/Director Matt Cimber is conspicuous by his absence. BW: In the beginning he didn’t know us. We had made The Rock-afire Explosion which wasn’t some Sundance winner or anything like that so he was probably pretty apprehensive of what we were going to do. Brad talked to him three or four times and tried to explain the film but he really had no idea who we were and he just wasn’t going to mess with that. He had worked with Orson Welles, was married to Jayne Mansfield and here we are nobody’s asking him to do an interview. He was apprehensive which is understandable and so he just never agreed to do an interview. He’s friends with Godiva and now that he’s seen the film he told her he wished he would have participated. If he had it would have been a different film. That’s what I love about documentaries – something can shape the film that you weren’t expecting, that’s seemingly a bad thing, but can turn into something really cool. Being that he’s not interviewed in the film it kind of makes him enigmatic, like what’s his story? It makes you want to research him more. I always like that about documentaries when I get done watching them and I want to get online and research the people so I think it worked out. The four year run of Glow the original show must have meant you had a wealth of archival material to choose from. What was your criteria for selecting clips? BT: Well to be honest there’s a wealth of archival footage that exists but we didn’t actually have access to all of that. Ursula Hayden (Babe, the Farmers Daughter) as the owner of GLOW had several one inch reels from the original show but it’s a very small number compared to the number of episodes. A lot of what we gathered we hunted down ourselves from people who had VHS tapes so we really had to pull from what we could find. Once we got our hands on as much footage as we could, the criteria for selecting footage for the film had to with what was being talked about obviously but also ‘insanity’ – finding things that were just as outrageous as could possibly be that represented the show overall. So there’s footage in the film of women being made to jump through hoops of fire and chainsaws slicing things in half. You ran your Kickstarter campaign pretty late in the production process of GLOW, how come? BW: Our audio was kind of bad and we got an offer for a television deal. That turned it from, “Oh let’s work on the film and put in the money that we can”, into “OK, we NEED to finish all this stuff like licensing the music”. ESG is all through the film, we used a ton of their music. Their label was like, “Cool do your festival run, do whatever you need to do but whenever it comes to TV or distribution, let’s talk.” And so once we got that TV deal we had to secure the music rights and get E & O (Errors and Omissions) insurance which was all new to us. We also had to get HDCAM and do an audio remastering. We couldn’t have got started on doing all those things if we hadn’t done that Kickstarter, so thank God that came through or we’d have probably had to decline the TV deal because we couldn’t afford to put it on there. GLOW premiered at Hot Docs and then went on to win Best Documentary at Comic-Con. How have you found the audience reaction to GLOW from fans and non-fans alike? BT: It’s pretty much 100% with the fans. Watching the film in a theatre at festivals they’re so excited to see this thing from their childhood revived on screen. They’re shouting at the screen and clapping for their favorites. We expected that to a degree because there was a lot of anticipation for the film from that group but it’s the non-fans that we’re interested in also and so far it’s been pretty good. GLOW didn’t really air in Toronto so I’d say 90% of the people we talked to at Hot Docs had never seen GLOW and some had never even heard of it. Yet we had great turnouts for the screenings that Brett and I attended – everyone stuck around for the Q&A and the reviews in Toronto were generally favorable. Overall we’ve had positive responses from most people who watched it. I’m presuming that for the wrestlers you feature, the documentary has come almost as a validation of that period in their lives. BW: Yeah we hope so. I remember we’d be interviewing someone like Ninotchka and Brad would say, “Oh my God, we have to have her stepping on the flag or throwing it away!” There’s some stuff we couldn’t find but we tried to show their peak, their best moments where they really looked amazing and the archive footage encapsulated their whole experience as part of GLOW. I never want to make a documentary where people let us into their homes and lives, open up to us and then we do something that they hate or they’re embarrassed about. I always say that I want to be able to sit in a theatre with the people that I’ve made the film with, sit next to them and not be embarrassed or weirded out. I want them to be proud of what we did. We strive for that. Luckily, all the women have been pretty happy with what we did and like you said, we kind of captured that moment in time for them that they can always watch. Co-creators Liz Flahive and Carly Mensch have said that your original documentary provided the spark that led to the creation of the TV show. Were you guys contacted by them at all? BT: We were definitely excited to hear that the doc inspired the show. We weren’t contacted to be involved with the new show, but it’s been cool to watch it all unfold. Do you know how any of the Gorgeous Ladies of Wrestling feel about the fictionalised versions of themselves? What are your thoughts on this verson of the events you documented 5 years ago? BW: We don’t have much contact with any of the Gorgeous Ladies of Wrestling these days, but we do from time to time talk to Angelina Altishin who played Little Egypt on the original show. Angelina is in contact with many of the original actresses and she keeps up updated on all things GLOW. I have not watched the new GLOW series yet, but plan to as soon as possible! I always say that I want to be able to sit in a theatre with the people that I’ve made the film with, sit next to them and not be embarrassed or weirded out. BT: Other than Angelina, I’ve chatted with Dee Booher (Matilda the Hun) a few times. She’s an incredible woman, and she always updates me on the world of GLOW. Judging by social media, it seems like all of the original GLOW girls are excited about the new show. I watched the first episode and it was a lot of fun. I’ll be interested to see how the end of GLOW is portrayed in the series. GLOW: The Story of the Gorgeous Ladies of Wrestling is also currently available to watch on Netflix, was that a direct result of the new series? BW: Netflix originally acquired GLOW in 2012 for 3 years after our film festival run, but this new deal was definitely a direct result of the Netflix series. What projects are you both working on at the moment? BW: We just finished a new film entitled A Life in Waves which premiered at SXSW this year and just got picked up by Gunpowder and Sky.